Gene Chiovari is one of the biggest Rocky Horror fans there is, or ever will be. His history and passion for the Rocky Horror scene goes back many years, and probably will never stop. Gene first went to Rocky Horror in 1978 at the Biograph Theater in Chicago. Five years later he was head Frank and soon after became cast director. Gene has had casts all over the Wisconsin and Illinois area, and at the moment he is cast director of "Completely Crazy" at the Mundelein Theater in Mundelein, Illinois (special note: Gene is also the theater manager). Gene is not only a veteran of the cast scene, he is also a familiar face at the various conventions. He ran two Rocky Horror conventions - one in 1987 and one in 1988. Richard O'Brien himself was his special guest when his cast performed the live play (without the movie) at the '88 convention. 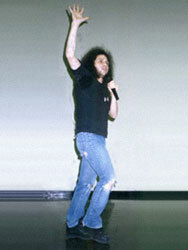 Gene has since appeared at all of the major conventions doing his now legendary "Rocky Horror Pledge" the same one created by Richard O'Brien at the 1988 convention. Gene has also performed at some very major Rocky Horror events, including the first televised Rocky Horror Picture Show on Fox (1993) and at the 20th Anniversary in California. Gene is also one of the biggest collectors of Rocky Horror merchandise. His collection has everything from rare photos to videos; to soundtracks and posters; to playbills and magazines. Gene always enjoys trading with Rocky Horror fans to increase his collection. And on top of all that, Gene is also co-producer of a Rocky Horror/Shock Treatment magazine called "Crazed Imaginations". The fanzene comes out each and every month, which means that every 30 days Gene has a chance to show off some of the rare photos he has, much to the delight of his subscribers. His most favorite part of Rocky is "I'm Going Home", and can be seen here in his "floor-show Frank" costume (which is perfect, down to the smallest detail) with Bill Brennan as Bert Schnick from Shock Treatment. Gene is extremely proud of his costumes, his love of Rocky, and his devotion to the scene, the fans, and the continuation of the movie he loves so much. He is one of the few true "long timers", and will no doubt continue as such until the day he dies. His kind are few and far between. Send SASE for prompt reply.